Welcome to our April release! This one is chalk full with updates for everyone, so let’s get started. 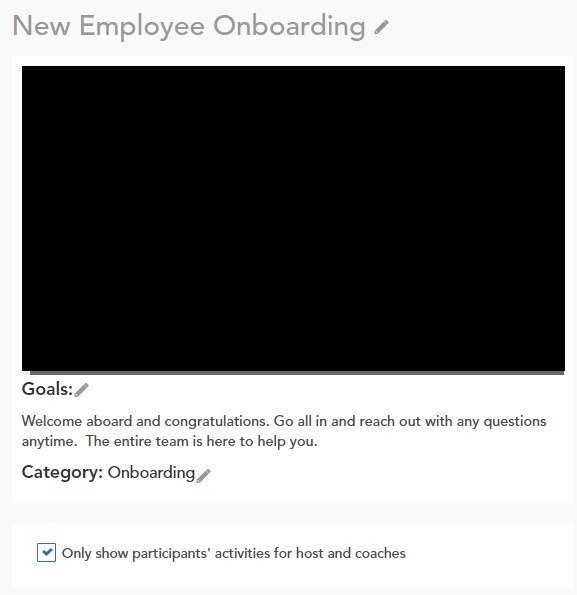 If you are a watcher of a group, those members will now appear in your Team Dashboard. To select a group to view, go to the drop-down under the “Back to Home” button and select the group. The dashboard will then update with the list of members within that group on the left and their stats on the right. You can select individual members of that group to see their specific stats and go to that program to review. Learn more on how to set Watchers for Groups here. From your customer feedback we have improved our new Pitch Module so its even more powerful within Huddles. Now you can have up to 8 criteria per Pitch Module with all custom names. We also improved handling of scoring to reduce chances of leaving a review without changing the scores. 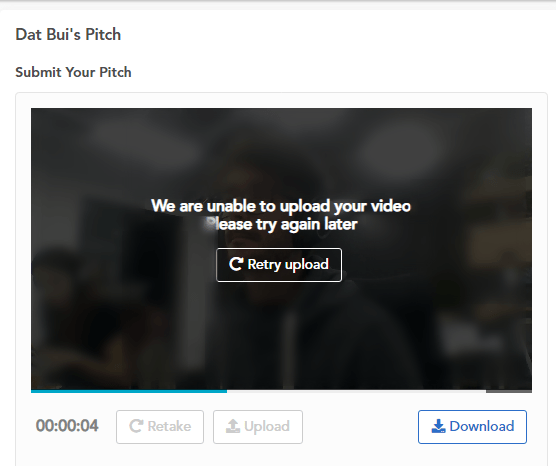 You can now download pitch submissions directly from the screen! 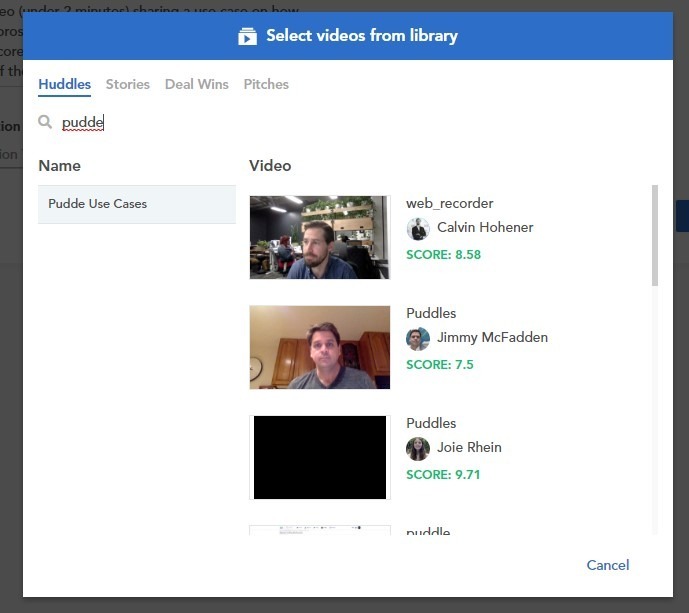 As a coach or host of a huddle you can download all pitch submissions and as an individual can download your own. Have a pitch submission you want to add to another huddle? You can now add existing pitch submissions by going into your video module and selecting: “Select Existing”. We included search and scores for pitch submissions for even better usage. (Old) Pitch rollout information here. We added Groups and File Views within our new Analytics. This allows you to easily report on users within a Group(s) and see where a file has been viewed. To access these new measures and attributes go into the “Builder” and on the left column look for “Groups” and/or “File Views”. With the new “File Views” you can now see where a file was viewed if in the Salesforce plugin, Web, or Mobile which allows deeper analysis of content effectiveness. We have a lot of customer requests being released, we appreciate all feedback that you give as it helps make SalesHood a better platform for knowledge and content. Please note that only the Host and a Coach can turn this on for a path and within each huddle or pitch managers and above can see all activities. Individuals can only see their own activities. 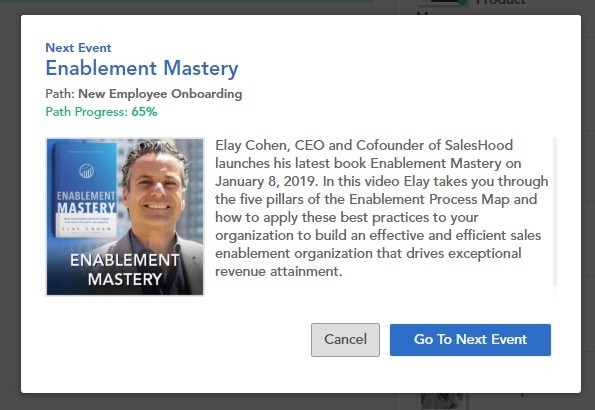 With Hidden Activities on, within each Huddle and Pitch in the Learning Path you will see a box displaying it is turned on for that event with a link to the path that is enabling the hidden activities. 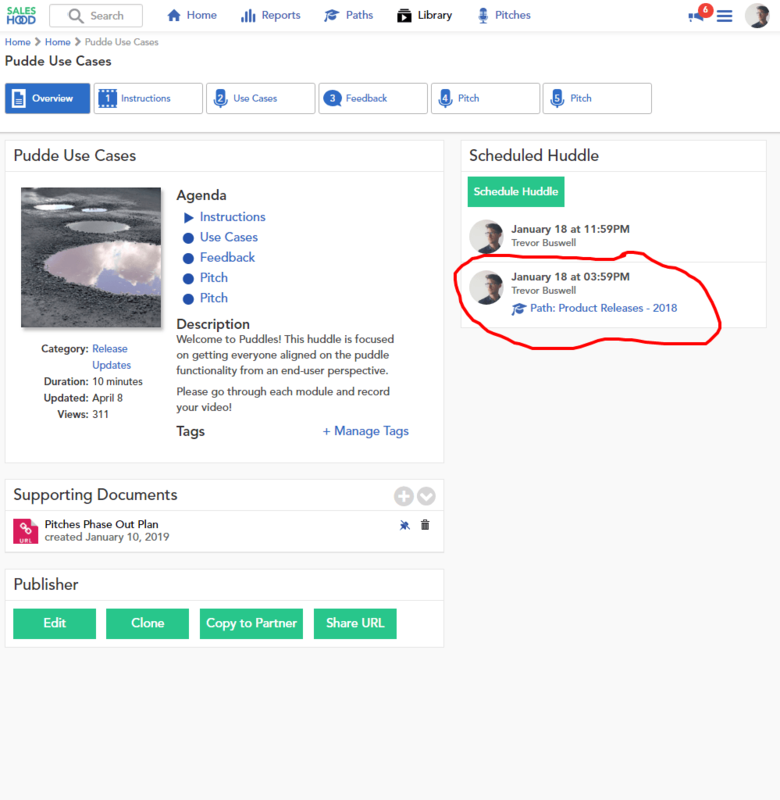 Within the huddle template, you can now see which path a scheduled huddle belongs to with a link to that path. They are no longer hidden from the huddle template they were created from! You can now add descriptions directly to 3rd party integrated files within SalesHood. If the file has an existing description, it will sync over upon first adding to the instance and will display above. Previously, when an email was sent from SalesHood to participants they were all marked within the “To” field. We moved those participants into the “BCC” field so they can now only see themselves and there shouldn’t be anymore fun “Reply All” incidents. We updated our web recorder throughout the app to support retrying and downloading in case uploading fails when recording. When uploading if you lose access to internet or something else occurs you can now directly download the recorded video to your local device for later upload. When you complete a module within a huddle, you will now see a “Done” banner for each module. This is a great way to see what is not complete from anywhere within the huddle. We updated the “Mover” from the “What is next?” of a Learning Path by removing the 10 second countdown, displaying progress % of the path, and better UI for “next event”. This sprint for mobile we continued the pitch module improvements, Hidden Activities, and added @mention in web support. On mobile, you can now see when a pitch module has more than 4 criteria. Including, we updated the UI slightly so its easier to use and display links as pitch submissions better. Do you have custom branding for your instance? If so, that branding is already in the nav bar of the mobile app, but now the load screen will display your custom logo and colors. Please note, upon first login it will not display as we do not know which company the user is associated with. Although, after the first successful login branding will appear. Just like on web, when Hidden Activities is turned on for a path it will display a green box and prevent that individual from seeing other individuals activities for all huddles and pitches in that path. Within the notifications tab, there are two new updates. When you receive a notification that is within the last 24 hours it will appear in the “New” section. All notifications older than 24 hours will appear in the “Earlier” section to make it easier to focus on the notifications you need to review. Now you can clear all your unread notifications in the list by tapping “Mark all as read” within the top right of the notification screen. This won’t complete the required tasks for you, but will remove the badges. When you are @ mention within the web of your instance, you will now receive a notification that links directly to that location on mobile. This allows you and others to stay informed just in time for knowledge or assigned tasks. These notifications can be turned off in the Notification Manager under “Settings” of the Hamburger menu on web. Share your feedback directly with the Product Team by emailing support@saleshood.com. We are always open and available to learn about your use cases for SalesHood.